Calendula Geisha Girl Calendula Officinalis is one of the most popular garden annuals. 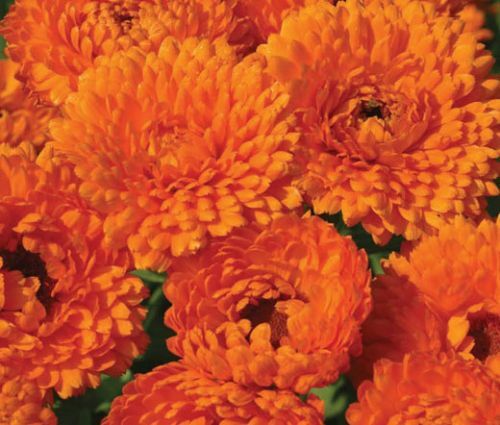 Calendula Geisha Girl seeds can be started indoors, and also called Pot Marigold this flower grows 20 inches tall producing extra large, chrysanthemum-like, fully double, deep-orange flowers with curved petals. Calendula Geisha Girl blooms repeatedly from spring to fall and its striking flowers attract butterflies, hummingbirds, and bees. Calendula Geisha Girl is an outstanding bedding plant and this flower is also a popular annual plant to grow in containers or pots. Pot Marigold looks beautiful in front borders and mass planting. Calendula Officinalis seeds have to be kept moist until germination, and the established Calendula grows best in full sun or partial shade requiring moist, but well-drained soil. This cool season annual thrives in the poorest soil and re-seeds itself freely. Calendula Geisha Girl makes a long-lasting cut flower.